The magic of Kelly Kingman’s visual content creation work takes place over a couple of days. But there’s nothing ephemeral about the impact it has on its audience. Kelly is a graphic recorder. She captures the main ideas from expert presentations delivered at live events, and turns them into memorable and eye-catching visual summaries on the fly. Her work was a hit at this year’s Content Marketing World, where she transcribed presentations from speakers like Jay Baer, Coca-Cola’s Jonathan Mildenhall, and Buddy Scalera on a big whiteboard next to each stage. After seeing the quality of her work, it’s hard to believe she’s only been at it professionally for about 18 months. “I’d been doodling pictures as part of my notes for a long time. 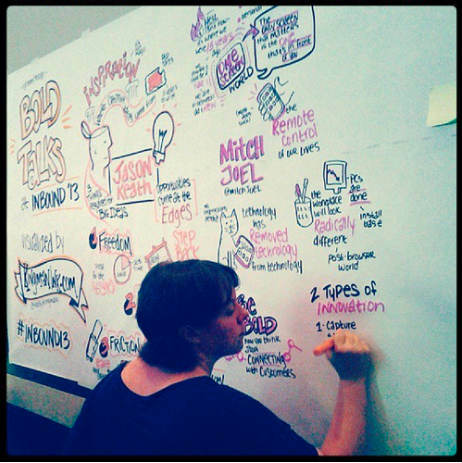 When I heard about graphic recording at a panel at SXSW Interactive I was blown away. I had no idea it was an actual profession,” Kelly recalls. Kelly was working as a content marketing consultant, when she got the opportunity to join a preeminent Brooklyn-based, a graphic recording company that works with Fortune 500 brands. She worked with them for a year before going solo this summer. Kelly considers graphic recording to be a great marriage between her artistic sensibilities and marketing background. Since starting her own company, Kingman Ink, she’s produced graphic recordings at HubSpot’s INBOUND conference and the Work Revolution Summit, among other events. Large brands have already latched onto graphic recording; but it’s a technique that is within the reach of content marketers with smaller budgets, too. 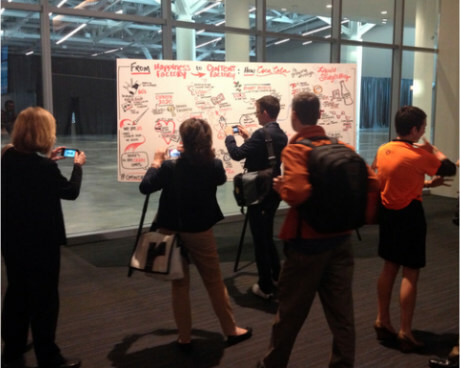 What makes graphic recording so compelling? Pictures, videos, and infographics are all testaments to the power of visual learning. Graphic recording takes visual content to a new level, combining words and images in a fun format that people really relate to. Some people are better able to translate (and recall) information when visuals are involved. For Kelly, graphic recording is a no-brainer compared to taking primarily text-based notes. “Drawing simple pictures is actually a much quicker and more efficient way to capture ideas than to capture them word-for-word,” she says. “Ability and practice make it easier for other people to interpret your drawings, too. 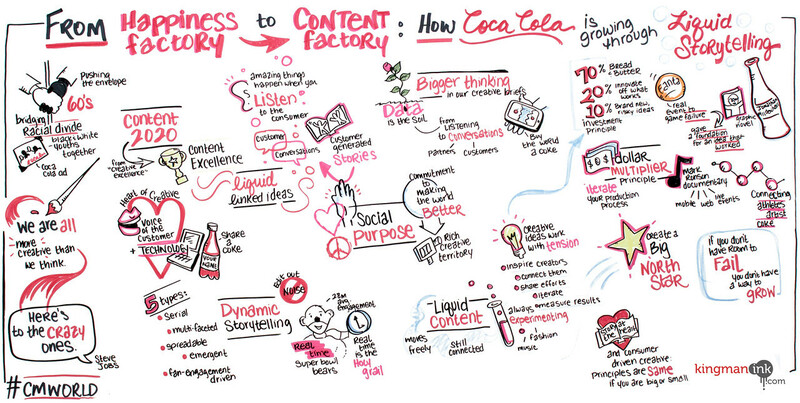 To create this visual content, graphic recorders listen for key ideas in a conversation. They’re trained to recognize verbal cues to identify these key ideas and quickly replicate them through drawings. This skill helps them to capture the essence of a live presentation in a short amount of time — a feature that seems to enthrall audiences both online and in-person. Graphic recordings are so fresh, in fact, that much of their appeal resides in watching the process itself unfold. Of course, not everyone is primarily a visual learner. But graphic recordings’ combination of pictures and words is novel, compelling, and memorable — and it gives content marketers an engaging way to test a new medium on their audiences. Graphic recording often makes its biggest impact on audiences that can watch the drawings unfold in real time. Yet, other attendees who see the finished image right after hearing a presentation can also benefit, as it can help make what they’ve just heard more memorable for a longer period of time. On the other hand, when available space or the format of a talk don’t lend themselves to large-scale or graphic recording, sketchnotes are another option for capturing the verbal and visual content. Sketchnotes are a close cousin to graphic recording, although the effect each produces is different. They’re smaller-scale depictions, usually drawn on a notepad or digital device. The audience doesn’t watch the artist in action, but does get to peek at and share the final product after the presentation is over. 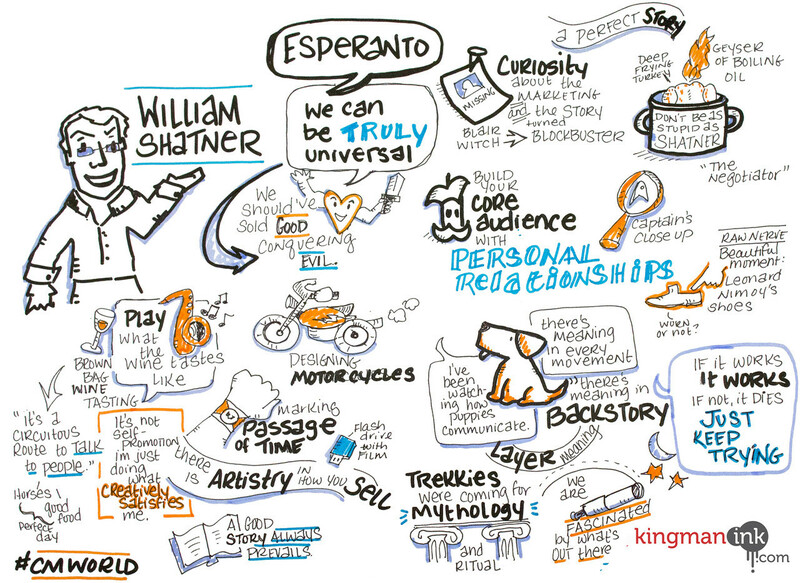 In essence, sketchnotes are illustrations done in real time. Content marketers can usually hire graphic recorders like Kelly for these, too, and can use them to accompany a range of different content marketing efforts, such as webinars or podcasts. These visual summaries derive much of their power from the live experience. But as content marketers, we’re wired to make the most of the product, too. Webinars typically follow the PowerPoint presentation format, where the speaker goes through bulleted slides with static pictures. Graphic recording is a great alternative to draw your webinar audience into the presentation. Hire an artist, share her tablet screen, and start presenting in style. According to Kelly, some conference audiences are shy about snapping pics to share as social media fodder. She says it helps to have presenters encourage the audience to get pictures of the graphic recording in process, and share them with their followers over Twitter, Instagram, and other social media. A tool like Prezi makes it simple to view large, complex idea boards in the limited space of a web page. Viewers can easily zoom in on different elements of the graphic recording to process each of the ideas individually. The next best thing to attending a conference is watching video afterwards. Video is a crucial part of professional events. Get footage of your graphic recorder in action for use in a recap video or to use individually as a time-lapse video that points to your Prezi or SlideShare. CMI took Kelly’s images and put them into a SlideShare presentation that performed well. It’s a great way to repurpose the notes and get more eyes and more shares. Have you worked with a graphic recording artist in the past? Let us know about your experience and how you distributed your final product in the comments.